To help launch the literary nonprofit Narrative 4, Esquire asked eighty of the world's greatest writers to chip in with a story, all with the title, "How to Be a Man." 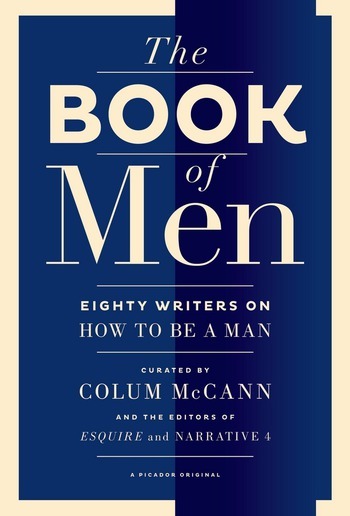 The Book of Men probes, with the poignant honesty and imagination that only these writers could deliver, the slippery condition of manhood. You will find men striving and searching, learning and failing to learn, triumphing and aspiring; men who are lost and men navigating their way toward redemption. These stories don't just explore what it is to be a man or how to achieve manliness, but ultimately what it is to be a human—with all of its uncertainty, complexity, clumsiness, and beauty. With contributions from literary luminaries as diverse as the subjects they capture, and curated by the editors of Esquire, National Book Award winner Colum McCann, and Narrative 4, a global nonprofit devoted to using storytelling as a means to empathy, The Book of Men might not teach you how to negotiate a deal or mix a Manhattan, but it does scratch at that most eternal of questions: What is a man? Colum McCann, a contributing editor at Esquire and cofounder of Narrative 4, is the National Book Award–winning author of Let the Great World Spin. He is also the author of Dancer, Everything in This Country Must, This Side of Brightness, Fishing the Sloe-Black River, and Songdogs. His new novel is TransAtlantic. Esquire is a general interest men's magazine published by Hearst. Since its founding in 1933, it has been a showcase for the world's premiere fiction, from F. Scott Fitzgerald to Stephen King. Narrative 4 is a group of authors and activists who believe that something as simple as a story can change the world. It connects people and communities everywhere through the sharing of stories and works to create a global narrative for all of us.